Latest Govt Jobs Recruitment Web Online Notification 2019-Daily Government Jobs 2019 Exam Syllabus: INDIAN ARMY 313 COY ASC RECRUITMENT NOTIFICATION 2017 APPLY CHOWKIDAR,DRIVER,COOK,FIREMAN 102 INDIAN ARMY GOVT JOBS ONLINE. 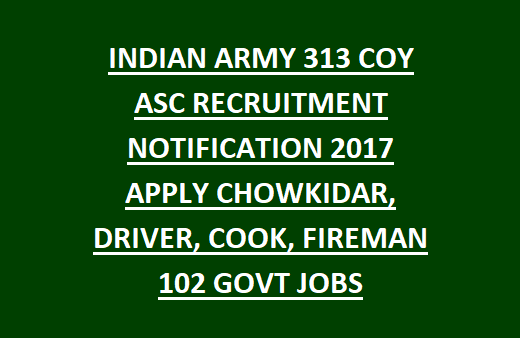 Home 313 313 Coy ASC 313 Coy ASC Recruitment Army Jobs ASC Cook Coy Driver Govt Jobs Indian Army 313 Coy ASC Recruitment Indian Army Jobs Indian Army Recruitment Recruitment Notification INDIAN ARMY 313 COY ASC RECRUITMENT NOTIFICATION 2017 APPLY CHOWKIDAR,DRIVER,COOK,FIREMAN 102 INDIAN ARMY GOVT JOBS ONLINE. Fire Fitter, Fireman others. Indian Army Jobs Interested and Eligible candidates can apply by filling the application format within 30 days and in remote areas within 37 days from the date of publication of the Indian Army 313 Coy ASC jobs Other details like age limit, educational qualification, selection process and application process for Indian Army 313 Coy Asc Jobs go through the details given bellow. ASC Eastern Centers Recruitment of Tradesman Mate recruitment of 102 Fire Engine Driver, Station Officer, Fire Fitter, Fireman others Jobs notification was released Indian Army 313 Coy. Interested candidates should apply by filling the application form for Indian Army 313 Coy ASC Jobs. On or before the last date. Eligible Candidates age should be between 18 to 25 years. Age relaxation is applicable for the reserved category candidates per rules. Indian Army 313 Coy Recruitment Application Should reach within 30 days & for remote areas within 37 days from the date of publication of this advertisement.